The Royal Goan Beach Club at Royal Palms has been designed in a colonial style with attractive facades and balconies. 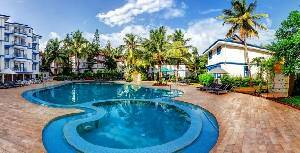 Landscaped with lovely gardens that also feature the palm trees that give the resort its name, this resort is situated very close to Benaulim beach. It features a selection of studios, one and two bedroom apartments on different floors. The resort offers you the whole range of holiday amenities to help you have that complete and well deserved vacation.